As the drummer for "Mr.SIRIUS," the Japanese progressive rock band, Chihiro Fujioka has been involved in both music and game design for a long time. He joined XTALSOFT in 1983, working as a game producer before moving up the ranks. After transferring to SquareSoft in 1990, Fujioka-san served as the director of "Sega 3," "Mystic Quest," and "Super Mario RPG." He also contributed to the composition/arrangement for "Sega 3" and for "FINAL FANTASY X," as the drummer on the theme track "Otherworld." He went on to found ALPHADREAM, where he served as the designer for several "Mario & Luigi" games. 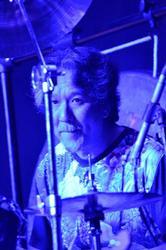 In October of 2012, Fujioka-san joined Earthbound Papas on drums.